Kame: Like, I have a question. When you go out on a walk, do you have a goal? Gaki-san: Of course. I have a set route. Kame: But… ultimately, you just go back home, right? Kame: But it’s like… what exactly is “taking a walk“? Gaki-san: Taking a walk is… you get home from work, and once it gets dark and it’s nice and cool outside, you just go out. Kame: And what do you do once you’re out there? 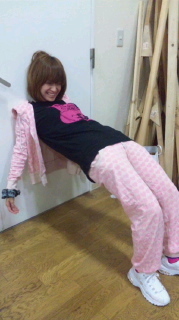 Gaki-san: Nothing. You just walk. Kame: It’s fun to just walk? Kame: I could never do that! Kame: Wow. I love your life. Fan mail #1: Morning Musume recently became “Muten Musume” and released a CD under that name. When they did, the members of the group were also made into anime characters. The listener wishes to know if the hosts’ favorite types of sushi are indeed the same as those of their animated counterparts: eel for Gaki-san and umeboshi for Kame. Gaki-san reveals that while she does like eel, she never actually said so to the staff: she simply said something about how it might be nice to make her into the character that likes “dessert sushi” — something like chocolate, for example. Ultimately, they made her into the eel character. Kame’s character has an umeboshi on her head, and she too didn’t actually say that she is particularly a fan. 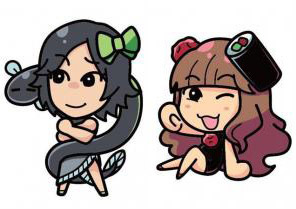 However, she heard that it was actually Tsunku♂ who decided that she should be the umeboshi character. “I guess that also means Tsunku-san thinks I’m somehow eel-like, huh?,” Gaki-san asks. Fan mail #2: This listener reports that they will soon have to get an injection. He doesn’t exactly like injections, however, and so he asks the hosts for advice as to how one should go about distracting themselves in order to not feel the pain of an injection. Both of the hosts say they hate injections as well. Kame recounts a recent episode. She was about to receive an injection, so she sat in the chair, pulled up her sleeve, and thought she’d just try to somehow bear it. But when the nurse started looking for a vein and they brought out the needle, she suddenly asked if it was okay for her to lie down. The nurse said it was completely fine and that lots of patients ask to do it that way. 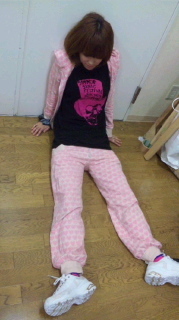 After trying it, Kame found it so much easier to receive an injection when lying down rather than sitting up. Gaki-san thinks there’s something a bit embarrassing for a twentysomething to be asking to lie down just for an injection. Kame realizes this: in fact, she noticed the nurses at the office (all six of them) suddenly staring at her and looking a bit taken aback by her asking for this service. The nurse kindly explained that Gaki-san doesn’t have to sleep if she doesn’t wish to. Curiously, Morning Musume has also had members who actually like injections. According to the hosts, these members include Tanaka Reina, Kusumi Koharu, and Ogawa Makoto. For the first battle, our hosts do some fan-submitted tongue twisters. Kame wastes no time in losing. For the second battle, the hosts play a game where they must together count to 24. Each host only gets to say up to three numbers, and the one who says the final number loses. Kame: 19. Gaki-san, you should admit that you’ve already lost. Kame wins. Their manager teaches the hosts a technique to always win at this game: you simply need to make sure that you say the numbers 3, 7, 11, 15, 19, and 23. The final showdown has the hosts engaging in a conversation battle where they can each use only three Japanese characters per turn. Kame loses as no one knows what “saseto” is supposed to mean. Thus, the winner of this week’s showdown is Gaki-san. Kame (while pretending to sit on an invisible chair): We’re waiting for your messages! 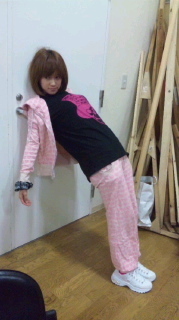 Go ahead and ask us anything, such as “is it true that something amazing happens when Kamei Eri does a headstand?” Anything goes! >Kame: But it’s like… what exactly is “taking a walk“?